Bicycle! Bicycle! 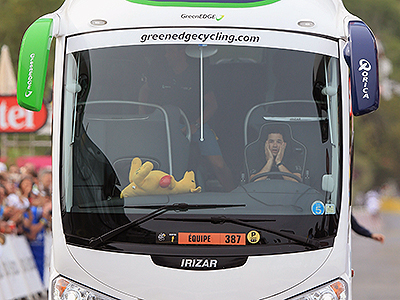 : Tour De Bore 2013. 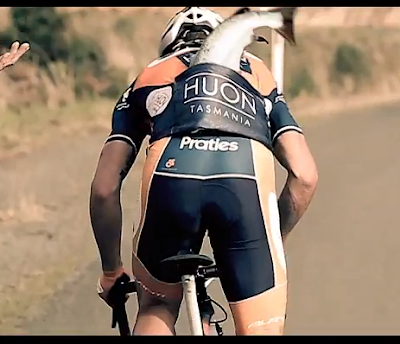 In case you didn't know, Tasmanian Salmon is a B.F.D in Australia. 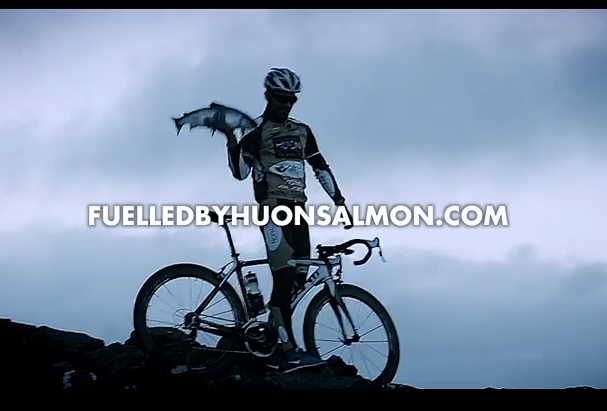 And in case you missed the long form of the campaign, Tasmanian Salmon is a 'natural performance enhancer' (Sneer sneer on YOU, dopers!) 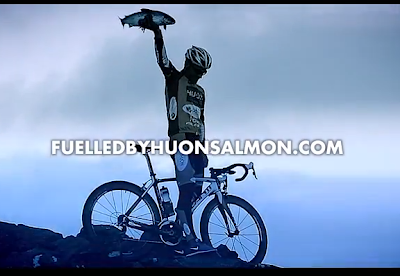 as evidenced by the fact that Tasmanian Pride and Tour De France Person Richie Porte is a graduate of 'The Huon Salmon – Genesys Wealth Advisers Pro Cycling' team. You know, that one. I particularly admire the whacked-out VICTORY! closing shot which I get to see every single ad break because the live feed cycles (see what I did) through the same 3 advertisements every. Single. Night. Yeah, that's a pretend live salmon stuffed near his crack. Even before moving here I had eaten my own enormous share of Tasmanian salmon and while I can confirm it is delicious, it has yet to propel me far beyond the Burnie Boardwalk. One thing you will see if you watch the long version or visit the website is where Porte got his stamina; A lot of Tasmanian landscape is featured, nonsensically masquerading as France (The Allez! sign) or at least as somewhere more exotic than down under Down Under but you can clearly see it is made up of the kind of gradients that would serve you well if dreaming of the Tour. Until the bitter end of this event, Ginger and I will continue to stay up until 2am waiting to watch one minute of cycling even though the preceding 3 hours and 59 minutes contain not nearly enough castles and bloodshed. For that, I still have my Game of Thrones book.